Let’s be honest, this has been one long, cold, winter. If you’re like me, you’re dreaming of spring, when color returns to the shelves of the Off the Vine Market. Maybe you have, as the Verano household has, run out of ideas about what to do with sweet potatoes, butternut squash and kale. Perhaps, as the winter of our discontent comes to a close, you, too, find yourself staring at your barren garden trying to will something green to burst forth. 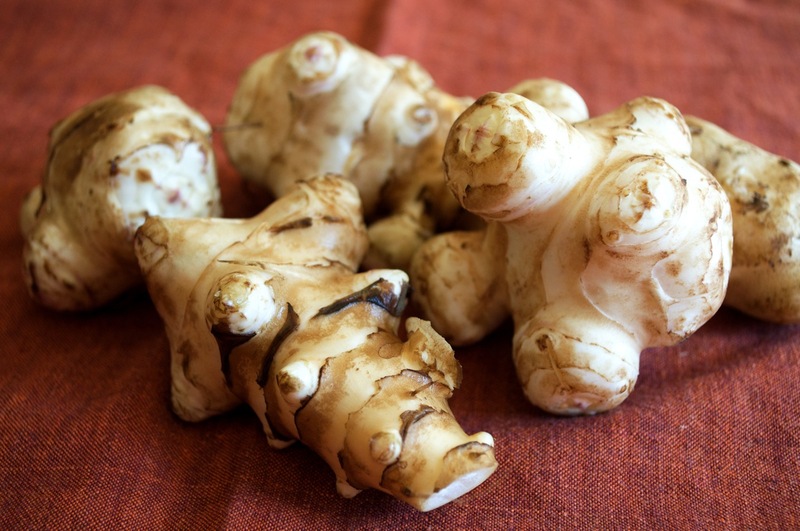 Just when all seemed lost, and the gray skies once again threatened another round of snow, a ray of hope arrived in the form of the Jerusalem Artichoke, aka, sunchoke. Jerusalem artichoke, botanically-named Helianthus tuberosus, is the tuber of a variety of perennial flower in the aster family. The flowers look like small yellow sunflowers. Also marketed as sunchokes, these gnarly little tubers look a lot like ginger root. Perhaps the most important root cash crop to originate in North America, the tubers have a potato-like texture often recommended as a potato substitute for diabetics. Despite the cautionary tales of gaseous eruptions, Kathy and I decided we would throw caution to the wind—much better than breaking wind—and add them as a side dish to a recent meal. I’m happy to report that, not only did we not experience the aforementioned tooting, we found them to be delicious, and are now ready to toot their horn (sorry, that was too hard to resist). There were plenty of recommendations for preparing sunchokes, to include both cooked and raw recipes. Since the gas factor reportedly increases when eaten raw, we opted for a cooked version. We found that the simple method of cutting them in half, sprinkling with salt and pepper, coating with olive oil, and roasting until tender, to be sufficient. They were slightly sweet, nutty and without the bitterness of some root vegetables. Given the ease of preparation and its versatility, it is easy to imagine adding this tuber to a variety of dishes. Cooked quickly in an Asian dish, they would add a crunchy alternative to the water chestnut. Cooked and then mashed, or pureed, they would make a good substitute for potatoes. Finally, if you’re adventurous, you can eat them raw on salads or as a light, healthy snack. However you decide to try them they’re a good way to banish the dark days of winter: let the sunchoke in!